We have numerous ways in which bookings can be made and accepted; email (bookit@yorkshire-activity-centre.co.uk), using the contact form on our website or via telephone (01904264643). All bookings require either a 50% deposit or full payment at the time of booking to hold the date and time requested. You are advised which type of payment at the time of booking. The remaining balance is due 7 days before an event. On receipt of the required payment and final availability check, you will receive confirmation of your booking – which will detail full venue contact details and any other specific information, and a receipt for your payment. If you do not receive theses details, contact us immediately. If you fail to do this and subsequently cannot find the venue you must accept full responsibility. We can be contacted by phone seven days a week between the hours of 9am – 5pm on 01904264643 or 07894580167, alternatively we do have a voicemail answer machine system in place and endeavour to reply to any message within 24hrs. Please have full details of your booked event to hand. Our accepted date of cancellation is when your written cancellation is acknowledged in writing by us. Email: bookit@yorkshire-activity-centre.co.uk. The 31day rule includes weekends and bank holidays. Any reduction in numbers must also be in writing and acknowledged in writing by us to be considered valid. Any changes in participant numbers are subject to the same cancellation charges as stated above. Verbal changes and cancellations are not accepted in any circumstances. If an activity is cancelled due to bad weather or any other unavoidable circumstances by us, your booking will be rescheduled to a mutually convenient date for you and the venue. You can chose a date up to three months after the original booked date. Refunds are not applicable. Should you only be in the area of your booked event for a limited period of time and are unable to return to the same venue, we will either provide you with vouchers to the value of your event, or hold your monies on credit so you can book into a more conveniently located venue on a date of your choosing up to 3 months after the original booked date. Yorkshire Activity Centre LTD have the right, at all times, to refuse participants access to the booked activity at any stage of the booking and remove them from their venue if in their opinion the participants are under the permitted age; are the incorrect height or weight; are unfit to take part in the activity because of physical or mental impairment; be under the influence of alcohol or drugs; have arrived too late to take part in the pre-activity briefing; consider them to be a danger to themselves, other participants or members of staff ; or are displaying aggressive and abusive behaviour (verbal or physical). If any of these occurrences apply, the booking will have been deemed to have been cancelled and cancellation charges will apply. Whilst all our activities are as safe as they can be given their inherent physical dangers, it MUST be understood that all safety instructions, directions, warnings and all other instructions must be followed at all times during your time at the venue. You must listen carefully to all safety instructions and ensure you are wearing any safety equipment or clothing properly. If in any doubt you must seek further guidance and help from the team immediately. You must not attempt to go beyond your capabilities or engage in risky or daring behaviour other than what is involved in the activity itself. It is a given that you undertake the activity with the full understanding of the risks involved and accept responsibility for your own safety together with that of any minors for whom you have responsibility. You will be asked to sign a disclaimer before taking part in many activities to say you are mentally and medically fit and well. If you are in any doubt about the suitability of the activity for you, you must check with your GP prior to making any booking. If you refuse to sign a disclaimer at the venue you will not be able to take part and such an action will be treated as a cancellation. All the activities are described in as much detail as possible and are correct at the time each booking is made. All timings for activities are the total time for the sessions and not an indication of a per person allocation. From time to time activities do change both in price, type and duration. Our team will make every effort to provide additional information and clarification about any of our featured activities, however customers are deemed to have thoroughly familiarised themselves with the activity description, all restrictions, including height, weight and age restriction as detailed on our websites before booking the activity. No responsibility can be accepted by us for an inappropriate booking if you do not familiarise yourself with all aspects of the activity in question at the venue chosen either on our website or through your own enquiries before placing a booking. This is your responsibility. If you are dissatisfied with your activity in any respect, or you have any other complaint about the activity provider or any other matter in relation to the venue or its performance, then you must speak to the team on the day and come to an agreement about how you can resolve the situation. It will not be considered reasonable if you have not brought your dissatisfaction to the attention of the team at the time and then complain later. If you take part in an activity, either the booked activity or a replacement offered by the activity provider on the day, it is deemed that you consider that the activity of which you took part is entirely acceptable to you and that a complaint at a later date is unlikely to be considered. Should you have a complaint about the actual booking process, please email: bookit@yorkshire-activity-centre.co.uk. All communications with Customer Services must be in writing, as this ensures that all aspects of the communication between us are clear and unambiguous. Once received we will investigate and discuss the matter with the relevant parties. When we have gathered all the necessary information, we will get back to you. Our brand is well known within the UK and has acquired both registered and unregistered in its trademarks, domain names and logos. No one may use our names, trademarks, domain names or logos for any purpose without our express written permission. Any unlawful use of our brands will be dealt with by law. 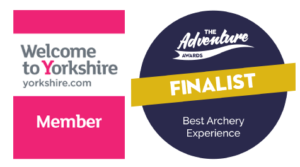 We appreciate that this is a lot to take in, yet we aim to ensure you have the best possible experience with Yorkshire Activity Centre LTD.